Blackwood is a hauntingly mysterious read that gave me chills from the moment I began reading. Gwenda Bond's debut novel captured my interest as soon as I recognized the blast into history that fuels Blackwood's plot. I have to mention how much I adore the cover because it's always a plus when a book's cover allows me to know the story before I've even started reading the story. The characters of Blackwood are so likable that I couldn't help try to solve the mystery with them as they uncovered the tragedy befalling their small town. Miranda Blackwood, Battle Star Galactica and frequent 'frak' fan, was so alone in her pain and need to leave the town she's doomed to reside. Phillips Rawling was no better off, taking on the bad boy role to escape the whispers he inherited. Together, Phillips and Miranda were unstoppable. I loved seeing how they reacted and responded to each other. It was almost as if they forged a bond that kept them sane through all the madness they experienced. Both characters were more than what they appeared to be and diving deeper into the story proves so. Blackwood's tone is dark and eerie despite the occasional bouts of laughter Phillips and Miranda conspired from me. I didn't expect much of what happens in the story and it took some time for me to twist and wrap my brain around some of the events. The Lost Colony legend is not one I've heard much about before and I love how Bond infuses it into a contemporary setting. 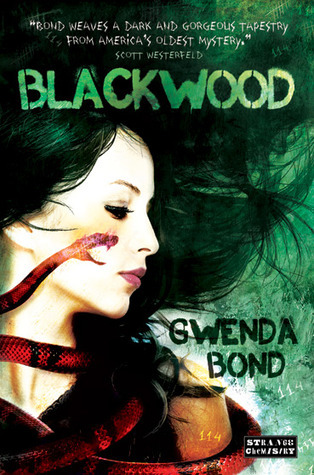 Blackwood has pretty much shaken what my idea of a supernatural mystery is and I'm anticipating the next novel from Gwenda Bond. Great review. I have this one to read on Netgalley. Can't wait. This sounds very interesting! I hope I win a copy, and if not, I will consider buying it! Thanks for this review! Thank You this sounds like an interesting book.Hope to win. Great Review! Now I really want to get my hands on this book! I happened onto this book by accident and I am so greatful I did. Sounds so good!! I have always been loved the Roanoke story. SOunds like a great twist on it! This book sounds so good! I can't wait to read it! Thanks for the awesome review! nice riview..i cant wait to reading this books..putting it in my TBR.. I got this book via NETgalley and really like the mystery of the missing! I hadn't heard about the legend either. I'm curious how this will end. As a frequent Visitor to the Outer Banks I've seen the Lost Colony presentation numerous times. I love the idea of this book! Wow, cool! I've never experienced it, but I think you'd really enjoy how Gwenda depicts The Lost Colony presentation. Wow... this book is about a whole group of people who just vanished?? OMG I need to read this! Awesome storyline! I had to Google The Lost Colony to find out its history. This book sounds like a good read. Oooooo...a supernatural mystery! I'm hooked...thanks for a great review! I'm ready to read it now! Supernatural Mystery? Two of my favorite genre's :) Looks like a great read! Thanks for the review. I can't wait to read this book! It sounds amazing!!! I've never heard of the Blackwood legend, and it's probably better so if I'm going to read this book. I've really been wanting to read a good mystery lately. And I love darker mysteries. The fact that it is still capable of eliciting laughter intrigues me. I definitely want to check it out!